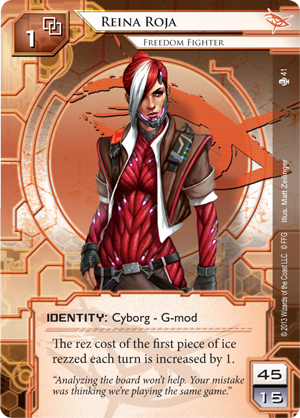 The cyberstruggles of Android: Netrunner have always been a risky affair for all involved, but with its sixty new cards (three copies each of twenty different cards), Mala Tempora raises the stakes to all-new heights. Will you be able to plug its upgrades into your deck and find success? Or are you the one who will fall behind? Whatever the outcome, it won’t be dull. 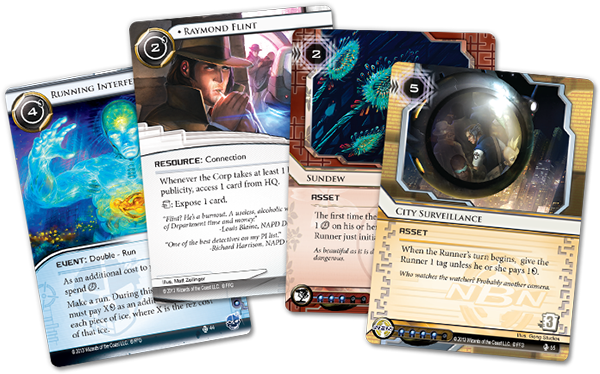 The runners and corporate executives who direct the struggles of Android: Netrunner lead frantic lives full of fantastic highs and staggering lows, and the pace doesn’t slow a beat in Mala Tempora . Many of its cards encourage daring gambles, staking health and fortunes against opportunities to rapidly accelerate wealth and success. Of course, in an age of technological one-upmanship, why play fair? 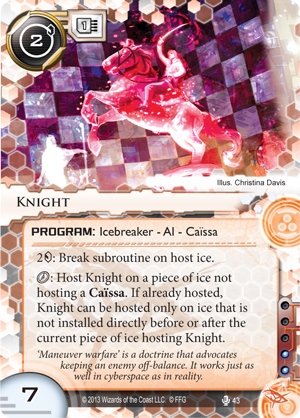 Mala Tempora also introduces a number of programs and ice that allow runners and corps to “cheat” these wagers by stealing information about their opponents’ cards. When I was creating Reina Roja, the Red Queen, I wanted to illustrate her mastery of strategy and her command of tactics. She is a former member of an elite special forces unit, and making her a chess master made a lot of sense. Meanwhile, I’ve long been fascinated by chess, back since my father first taught me so many years ago. In a lot of ways, my love of games, and particularly of strategy games, can be traced back to those early sessions with my dad. I wanted to come up with a unique method for Reina to approach her runs, and working from the idea that she was a chess master led to some really interesting card ideas and interactions. The final cards, I think, hit just the right tone, being mechanically interesting, thematically compelling, and powerful in game play. Caïssa is the name of a Thracian dryad seen as the goddess of chess, and was my first choice as the name of the subtype that would tie the chess pieces together both mechanically and thematically. The ability to move the Caïssa programs from ice to ice and server to server couples with the Reina Roja identity and her Console Deep Red ( Mala Tempora , 42) to create the sense of a game within a game. 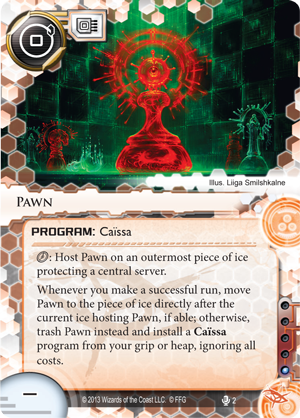 The better the Runner can maneuver his Caïssa programs, the more pressure he puts on the Corp, and the easier he can make his way through servers. 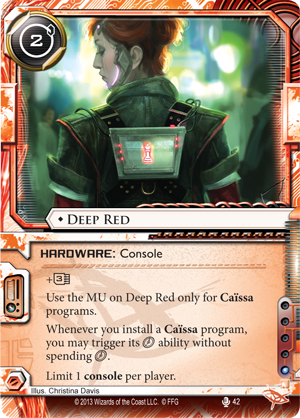 Deep Red is an homage to the first chess computer to beat a reigning world champion, and once it’s in play, Caïssa no longer count against your MU the way normal programs do. They also become more click efficient. 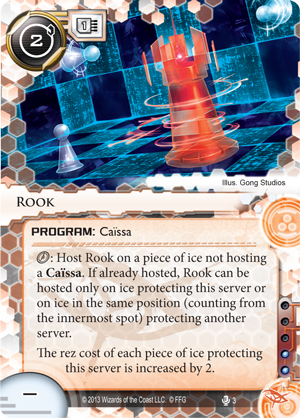 Together with the Reina identity and Rook ( Opening Moves , 3), these Caïssacan make it prohibitively expensive for the Corp to rez multiple ice on the server you most want to hit. 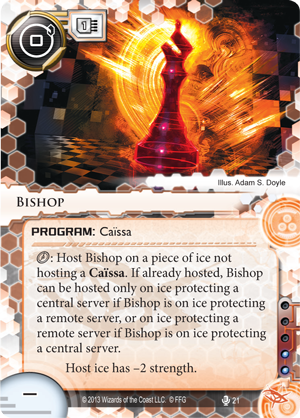 Then, if you host a Bishop ( Second Thoughts , 21) orKnight ( Mala Tempora , 43) on that piece of ice, the Corp will be forced to consider trashing the compromised ice for which it paid premium. If they do trash it, a single Pawn ( Opening Moves , 2) can bring into play the best Caïssa program in your grip or heap after you make a simple run on an under-defended server. The question isn’t if you play the game; it’s, “Which game do you play?” Do you play Reina and her suite of programs to sidestep the normal breaker suite, or do you play them to force the Corp to trash ice after ice in an effort to stay one step ahead of you? The cyberstruggles of Android: Netrunner can turn dramatically on a single bluff, so it’s no time to hedge your bets. Double down by playing the new high-risk, high-reward resources, assets, and operations from Mala Tempora ; then use its other cards to make sure you win your gambles!